Getting Things Healed (and Killed) is my attempt to update and modify Getting Things Healed by Dagma for 4.1 and my own personal needs. 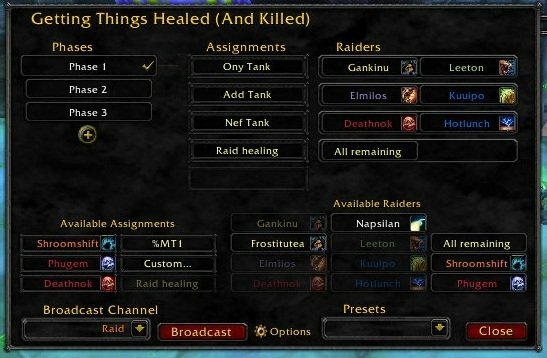 I originally just wanted all raiders to show up in the "Healer" list so I could assign them to interrupt or cooldown rotations. After doing that, I thought it would be a fun challenge to try to improve other parts of the addon. I am not a programmer by any means, and there are likely to be some features that don't function either due to the new patch or my incompetence in programming them. I don't take any credit for Dagma's original work, and he did an amazing job writing this addon. 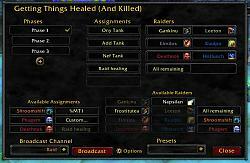 However, the original addon has not been updated since 11/2010. Use /gth to show the main window. Data transfer likely broke due to 4.1 prefix filtering, not a priority to fix. Maybe remove GUI option? Include every class as a "healer"
Keeping change log in main post for now. Last edited by Detvarjannik : 12-08-11 at 05:30 AM. Additionally, it would be awesome if you could have some kind of checkbox to allow a person to have multiple assignments, or have it popup to verify the multiple assignments? Great mod, just looking for a little bit more from it to really make it awesome. Or for that matter just give us a custom option under available raiders, as that would solve the "roles" issues and could solve the special dual assignments issues. /gth doesn't do anything for me. It recognizes the command, but simply doesn't do anything. Using the original GTH it did the same, then randomly worked for a week and then didn't load again, so I tried this updated addon, and still have the same problem.